Nitrogen is the most commonly limiting nutrient in annual crop production. Nitrogen is a component in chlorophyll, so N-deficient plants are usually chlorotic (lighter green or yellowish). Since N is mobile in the plant, symptoms begin with the older leaves while the younger leaves appear healthy. Older leaves may die early. Nitrogen-deficient plants are usually thinner, slower-growing, and have smaller leaves [N26]. Flowering, fruit set, and fruit size are reduced in many species [N20,N41,N71]. Many crop types have characteristic symptoms. Some examples are given in the table below. For many plants, the yield potential is already reduced by the time deficiencies are apparent [N4,N52]. Therefore, soil and tissue testing is important. Nitrogen deficiency in sorghum. The symptoms start at the leaf tip and travel up the leaf. Lower leaves are affected first. Photos courtesy of the International Plant Nutrition Institute. Excessive N additions pollute the groundwater. In many crops excessive N causes too much vegetative growth. Depending on the crop this can lead to lodging, delay flowering and fruit maturity, and create a conducive microclimate for disease. In fruit-bearing plants, the fruit quality is sometimes lower [N41]. In rain-fed crops that depend on residual soil moisture, excess early-season N can stimulate too much vegetative growth, leading to premature moisture depletion [N1,N49]. Residual soil nitrate and irrigation water nitrate contribute to a crop's N supply. Soil samples can be sent to the lab for nitrate analysis or analyzed on-farm. A full discussion of how to use soil nitrate testing to support nutrient management in annual crops may be found here. Soil nitrate analysis can be combined with records of yields, fertilizer application rates and tissue analyses as part of a nutrient budget approach. Over time these values can be used to develop site- and variety-specific fertilizer rates and tissue N thresholds. The residual soil nitrate level depends on several factors related to soil properties, weather and crop management (see Factors Affecting Soil Nitrate-N). Therefore, soil tests must be done every year. Due to the variability of nitrate in the soil, care must be taken to assure that the sample is representative for the field (see Sampling Instructions). An accurate measure of its nitrate availability requires a sample of the main rooting zone. For vegetables, this is normally the top foot; for field crops, samples should be taken to at least 2 feet [N37]. Soil samples may be taken prior to planting or in-season, as closely as possible to a planned fertilizer application. Nitrate is mobile in soil, so if a sample is taken far ahead of a fertilizer application, a heavy rainfall or irrigation between sampling and fertilization can reduce the nitrate present in the sampled layer considerably, making the test meaningless [N22,N37]. Soil samples for nitrate analysis should be kept cool and sent to the lab immediately or quickly air-dried in a thin layer. A soil nitrate quick test, which can be performed on the farm with colorimetric test strips, is a good tool for making timely in-season N fertilization decisions. The quick test is highly correlated with the standard laboratory technique and is a reliable estimate of current soil N status. Although the quick test is less accurate than a laboratory analysis, its accuracy is generally sufficient for routine on-farm use when done correctly [N21,N24]. For the soil nitrate quick test, 30 mL of a calcium chloride (0.01 M) or an aluminum sulfate (0.025 M) solution are measured into a clean 2-oz bottle or centrifuge tube with a mark at 40 mL. Field moist soil is added until the extractant reaches the mark. The tube is then capped and vigorously shaken for about 1 minute to disperse all soil aggregates. The soil particles are allowed to settle until clear supernatant forms. The nitrate concentration in the supernatant can then be measured with a nitrate-sensitive colorimetric test strip [N24]. More detailed instructions can be found here. Pounds of nitrate-N potentially available per acre in each foot of soil can be estimated by multiplying parts per million (ppm) of nitrate-N by 3 - 4. For example, a nitrate-N concentration of 10 ppm in the top foot of the profile corresponds to 30-40 lbs N/acre. The multiplication factor is based on the soil bulk density. Lower values should be used for recently tilled or high organic matter soil [N37]. Soil nitrate behaves like fertilizer nitrate, and so the test value can be used to adjust application rates or determine whether a sidedress application can be postponed. An in-depth discussion with example calculations can be found here. When well water is used for irrigation, a considerable amount of N may be applied with the irrigation water. To convert nitrate-N concentration in the water to lbs N/acre, ppm nitrate-N in the water is multiplied by 0.226 and by the number of acre-inches of water applied. For example, with 1 acre-inch of water containing 10 ppm nitrate-N, 2.26 lbs N are applied per acre [N8]. More information may be found here. Non-uniform fields are best divided into uniform areas which are sampled separately. Atypical areas in a field should be avoided (if small) or sampled separately. For more information on sampling procedure see Plant Tissue Sampling. For some plants whole leaf N analysis is more common, while in others it's more common to test for petiole nitrate. Petiole nitrate concentrations are affected by environmental conditions, so petiole samples should always be collected at around the same time of day [N36,N54]. Tissue N tests are most meaningful if taken several times during the season [N43]. Plant nutrient concentrations vary depending on the plant part sampled and on the growth stage. For many crops, threshold values have been established for particular plant parts at specified stages [N9]. Talk to your local farm advisor or the testing lab before sampling to determine what part should be sampled and when. Even if no reliable threshold values exist for the crop or variety in question, suspected deficiencies can still be diagnosed by comparing an unhealthy area with a healthy one. Select young, mature leaves (or whole plants, if they are small) from several different representative plants in an affected area. Take an additional sample from nearby healthy plants of the same variety. This may be done at any growth stage, as long as both areas are sampled in the same way and at the same time. For crops with a long season, results of tissue tests can be used to determine whether in-season fertilizer is needed. For short- season crops, they can be used to adjust the N fertilizer rate for future crops. Tissue analysis is best combined with records of yields, fertilizer application rates and soil and irrigation water analyses, as part of a nutrient budget approach. Over time these values can be used to develop site-and variety-specific fertilizer rates and tissue nutrient thresholds. For annual crops, a plant's N requirement is a function of its total N uptake and how efficiently it can access the available N in the soil. The nitrogen use efficiency depends on the crop type, soil type, and how well irrigation and N application rates and timing match plant demand. In general, N use efficiency will be lower with flood irrigation, on sandy soils, and when all N fertilizer has to be applied prior to planting. Crops that are grown in both summer and winter will usually need less fertilizer in summer, because N mineralization from soil organic matter is higher in warm soils [N51]. The estimated crop requirement needs to be reduced to account for residual soil nitrate and nitrate in the irrigation water (See Soil Analysis). This target rate can then be adjusted during the season, based on the results of soil and/or plant analyses. An on-line N-rate calculator for several California crops can be accessed here. Usually it is more efficient to split N applications than to apply the whole rate prior to planting (see In-Season N). This is because most annual crops have a phase of slow early growth when they take up little N, which is followed by a period of rapid vegetative growth and N uptake. For many crops, a small starter application at planting is sufficient to support early growth (See Starter N). High rates risk being leached during the early season. Side-dressing most or part of the N rate just before the rapid growth phase helps ensures that enough N will be present to meet plant demand [N37]. Information on the seasonal uptake curve for major California crops can be found here, and for a number of minor crops here. If in-season or sidedress applications are not possible, preplant N should be applied as close to sowing/transplanting as possible. To avoid nitrate leaching, nitrate-based fertilizers should be applied after any pre-irrigation, especially if surface irrigation is used. General shape of the N uptake curve for annual crops. Crops that have a short season or are planted in warm weather (especially from transplants) have a shorter early lag phase and may benefit from a greater proportion of N applied pre-plant than crops with a long season, or crops planted in cool weather [N34]. More information on site-specific adjustments can be found here. Preplant fertilizer may be broadcast and incorporated, banded on or below the surface, or applied through drip lines. In general, placement near the plant is more efficient than broadcasting, since fertilizer placed near the plant is more accessible by the young roots. This is especially true for small applications [N58]. Nitrogen from fertilizers containing ammonium or urea can volatilize as ammonia gas and be lost to the atmosphere if they are left on the surface of neutral or alkaline soils. These materials should therefore be incorporated into the soil or washed in with rainfall or irrigation water within a day or two of application [N14]. Fertilizers containing ammonium and urea release ammonia into the soil, which can damage seedlings if it is placed too closely or directly beneath the seed row [N14]. For this reason, bands are commonly placed 2 inches to the side and 2 inches below the seed row. Greater distances may be appropriate for dry, sandy soils, high rates, and high-analysis fertilizer products [N26]. When properly managed, the fertilizer type does not affect the quality or yield of most crops [N29,N47,N55,N67]. Fertilizer choice depends on the weather (current and forecast), and fertilizer costs. Urea is inexpensive, high analysis and nitrifies less quickly than ammonium fertilizers. However, ammonium and especially urea-based fertilizers are prone to volatilization and should only be applied if they can be incorporated or if a rain or irrigation event of at least 1/2 inch is expected within a few days after application [N33,N49]. In shallow or coarse soils, nitrate-based fertilizers are not recommended because of their leaching potential [N47]. Fact sheets of the most common fertilizers can be found on the website of the International Plant Nutrition Institute. Nitrate is more mobile in the soil than ammonium, and is more at risk of leaching. Urease and nitrification inhibitors and controlled release fertilizers (CRFs) aim to reduce nitrate leaching by slowing the rate at which nitrate-N is released to the soil [N57]. They are most likely to be effective when there's significant in-season rainfall, excess irrigation, or when in-season applications aren't practical [N23], and with shallow-rooted crops [N3,N57]. However, for products where the release rate depends on temperature, insufficient N may be released to support peak uptake if the weather is too cold [N13,N47]. Research in California vegetable crops suggests that under normal conditions slow-release materials are not consistently better than split in-season applications of conventional materials, which is less expensive [N23]. Starter fertilizer, as opposed to preplant, refers to a small amount of fertilizer applied at planting, near or sometimes with the plant row. It is especially useful in cold, wet soils and for crops with small root systems. Most crops take up very little N during early growth. If in-season fertilization is possible, a starter application is often sufficient [N37]. Recommendations for California field and vegetable crops are generally less than 30 lbs N/acre [N25,N38,N42,N49]. Seeds may be damaged by salts in the starter fertilizer. As a general rule, no more than 20 lbs/acre of N+K2O should be placed with the seed [N26]. For crops with low salt tolerance, the amount of N+K2O in the fertilizer band should be minimized, and no N or K fertilizer should be placed in contact with the seed. Information on the salt tolerance of several California crops can be found here. In general, it is more efficient to band starter fertilizer than to broadcast it. This is because banding the fertilizer near plant row allows the small roots of the growing plants to access it easily. However, the band should not be too close to the seed, or seedlings may be damaged by free ammonia or salts [N26]. For many crops, placement 2 inches below and to the side of the seed row has been found to be safe and effective [N7,N26,N35,N62,N63,N64]. For dry, coarse soils and ammonia- or salt-sensitive crops, longer distances may be required [N26,N39,N63]. Some crops prefer a band directly below the seed. Talk to your local farm advisor for more information. Anti-crustants applied to increase stand establishment often contain usable amounts of N and P, which can serve to supply the needs of the young crop (Richard Smith, personal communication and [N27]). A low-N, high-P starter may be applied to transplants either in the transplant water or as a dip prior to planting [N28,N48]. Grain crops sometimes benefit from placement of a small amount of fertilizer directly with the seed ("pop-up placement") [N26], especially in cold, wet weather. However, excess amounts can inhibit germination. Fertilizer should not be placed with the seed when soils are dry [N61]. Banding of starter N and P together has been shown to increase uptake of both elements [N19,N53]. Ammonium seems to be more effective than nitrate [N19]. A low N, high P fertilizer such as monoammonium phosphate (MAP) is recommended. Urea and diammonium phosphate (DAP) should be used with care, as they release ammonia, which can inhibit germination [N6]. They should not be placed with the seed. In-season application rates should be adjusted to account for the nitrate present in the soil and irrigation water (See Soil N Test). As a general rule, crops will use N most efficiently when available N matches the crop demand. The cumulative N uptake curve of annual crops from planting to maturity generally follows an S-shaped (sigmoid) curve (see Figure). Little N is taken up during germination and seedling development. Nitrogen uptake is high and reaches a maximum during vegetative growth as the root system expands and leaves and stems develop [N15]. For maximum effectiveness, sidedress N and N fertigation should be timed to maintain an adequate N supply during this period of high N demand. If only one side-dress application is practical, the best time is normally just before rapid vegetative growth begins [N26]. Information on the seasonal uptake curves for major California crops can be found here. An N-rate calculator for several minor California crops with information on the seasonal uptake pattern is available here. If fertilizer is knifed in, it should be done early enough that the roots are not pruned [N26]. Late applications may be risky for crops where the mature product is harvested, as they are sometimes linked with quality reduction. This seems to especially be true where the harvested part grows belowground [N30,N36,N45,N62,N65]. However, late applications can increase protein in wheat [N40]. Appropriate application of in-season N varies with cropping system and fertilizer type. Some major forms are outlined below. In fields with pressurized irrigation systems, N is often most efficiently applied with irrigation water. This allows synchronization of N additions with plant demand and, in the case of drip systems, allows the nutrient to be directly placed in the root zone. Care should be taken that nutrients neither accumulate at the soil surface nor are leached past the root zone. Therefore, it's generally recommended that fertilizer is injected towards the middle of an irrigation, and terminated far enough from the end that it can be flushed from the system and washed into soil [N26]. In some crops, topdressing N through a sprinkler system can lead to disease issues [N46]. In addition, high rates may cause leaf burn in some crops [N47]. Water-run fertilizer in furrow irrigated systems can be inefficient due to uneven distribution and potential losses with tailwater[N59]. Topdress applications are common in small grains, turfgrass, and pastures. Both liquid and solid fertilizers can be used [N26]. When N fertilizer is broadcast, it needs to be applied 1-2 days before an irrigation or rainfall event to move the N into the soil [N33,N68]. Irrigating the field is especially important when urea or UAN are applied, because the hydrolysis of urea by urease increases soil pH, which can result in high ammonia volatilization losses when the material is left on the surface [N5]. Broadcast N may be immobilized by high-carbon residues decomposing on the soil surface, such as occur in conservation tillage systems [N26]. Liquid or solid fertilizers can be knifed in, injected, or dribbled on the soil surface and washed in with irrigation water. This tends to be the most efficient method for furrow-irrigated crops [N59]. The band should be far enough away from the plant row that it does not damage the growing roots, either through root pruning or toxicity from salts or ammonia in the fertilizer [N11,N26,N56]. If fertilizer is knifed in, it should be done early enough that it does not prune the roots [N26]. Many types of fertilizer are available. Details of major fertilizer types can be found at the International Plant Nutrition Institute website. In warm, moist, aerated soils, urea and ammonium are both quickly transformed to nitrate. Therefore, for non-deficient plants growing in the spring or summer, the form of N is usually not important. However, when fertilizer is applied to quickly correct a deficiency a nitrate-based fertilizer may be more effective than ammonium, which is held on soil surfaces and is not as easily distributed [N59]. For ammonium sensitive crops high analysis products such as anhydrous or aqua ammonia should be used with care, especially in cool weather [N17]. Foliar N applications normally don't have any value for non-deficient annual plants. They cannot replace soil applications, since only very dilute solutions can safely be applied without risking leaf burn, so it is generally not possible to apply enough to meet plant demand [N12,N26]. As a general rule, solutions should be less than 1-2% N to avoid leaf burn [N26]. Best results are normally achieved with 2-3 applications at short intervals [N16,N26,N32]. Different crops will have different tolerance levels. Talk to your local farm advisor for more information. Urea is the form that is most easily absorbed by plant leaves and is least likely to cause leaf damage [N12,N50,N60]. UAN is also commonly used [N12]. Low-biuret urea is generally preferred over regular urea for foliar applications. Applications to very young plants are unlikely to be effective, due to their small leaf area and low nutrient demand [N12,N50]. Foliar nutrients are most likely to be absorbed and least likely to cause leaf burn when they are applied to well-watered plants in the morning or late afternoon [N44,N50]. Applications should not be done on windy days, as this reduces distribution uniformity, or just before a rain is expected, as this may wash the fertilizer off the leaves [N12]. Phosphorus deficient plants are often stunted in growth and have thin stems. In many crops leaves have a purplish or reddish color, especially under severe deficiencies. 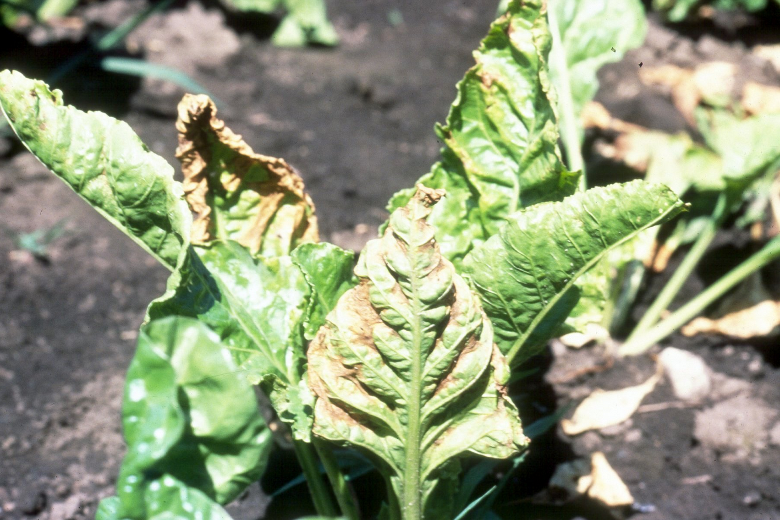 Phosphorus is mobile in the plant, so symptoms appear first on the lower leaves. Unlike N deficient plants, P-deficient plants are often characterized by dull, dark green or gray-green leaves [P2,P8,P17,P18,P33,P50,P52]. In cold or wet soil, P availability may be low due to slow root growth and decreased P mineralization by microorganisms [P51]. Therefore, P deficiency is most often observed in young plants in cold or waterlogged soil [P18]. In California, P deficiency often occurs in crops that follow rice [P4,P33]. 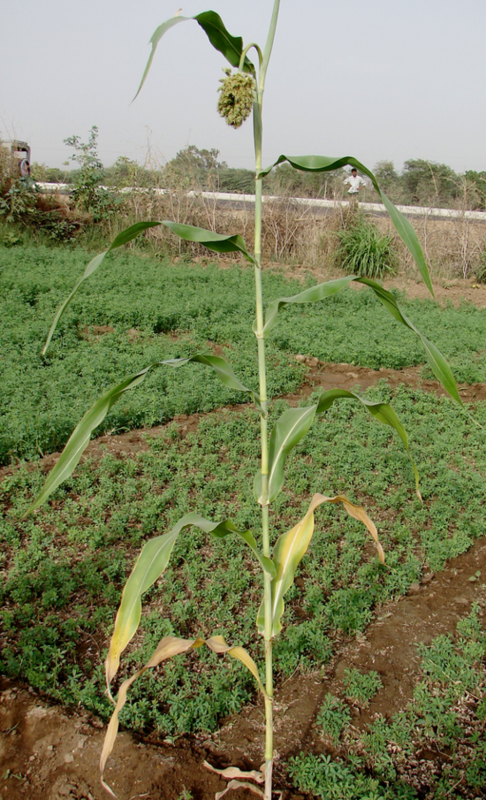 In some crops, P deficiency does not show any symptoms besides stunted growth. For this reason, soil and tissue analyses are important to confirm a suspected deficiency [P3,P18]. 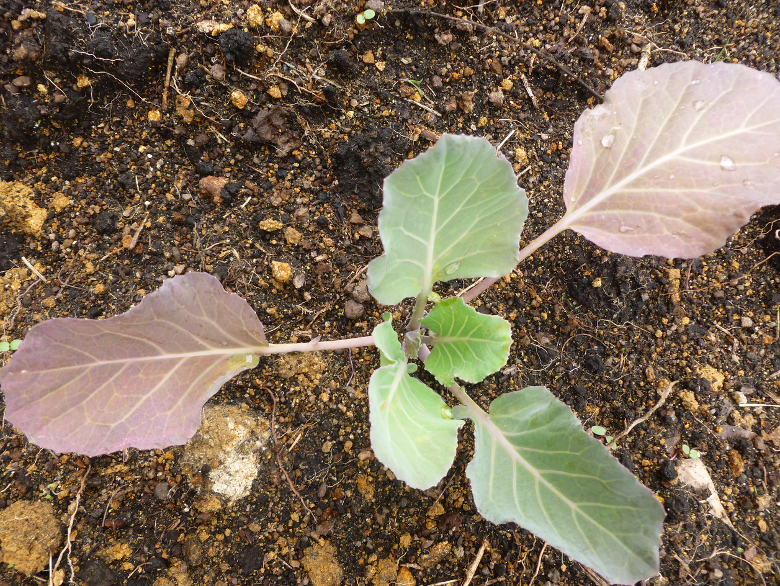 Purpling on the lower leaves associated with P deficiency in cabbage (top) and sorghum (bottom). Photos courtesy of the International Plant Nutrition Institute. Additional photos of nutrient deficiencies in many crops may be found here. Unlike nitrogen, soil P and K levels in soil tend to be stable, so tests do not normally have to be performed every year. Samples for P and K should be taken between crops, when no fertilizer has been applied recently [P10,P16]. In order to track trends over time, sampling should always be done at the same time of year. Soil samples must be representative of the field, or the test will be of little value [P10,P18]. A total of 20-30 cores should be taken from random locations within the field. Soil samples are usually taken from the top 6-12 inches of the soil profile [P10,P18]. Although the roots of most crops go deeper, this tends to be the major rooting zone for most tilled annual crops [P13,P23,P31,P46]. However, deeper sampling may be useful when planting a very deep-rooted crop for the first time [P39]. For more information on sampling procedure see Soil Test Sampling instructions. A detailed discussion of principles and considerations for soil P and K sampling can be found here. In California, the available soil P is generally determined on sodium bicarbonate extracts (Olsen-P test). This test is appropriate for soils with a pH between 5.5 and 8.5 containing less than 3% of organic matter [P41]. For information about the appropriate P test when your soil is outside of this range, contact your local farm advisor. When soil tests are performed regularly, trends over time indicate whether the fertilization program needs to be adjusted. To make accurate P fertilization decisions, soil test values are best combined with tissue P concentrations and P budgeting. In this way, P tests can be useful even for crops that do not have calibrated critical values [P18]. Application rates can be reduced or skipped when the soil test value is high. Soil P is less available in cold and wet soils [P18], when free lime is present [P43], and in crops following rice [P4,P33]. Under these conditions, crops may still benefit from a small starter P application, even under high soil test P [P24,P44]. Tissue tests are most meaningful if taken several times during the season [P28]. Plant nutrient concentrations vary depending on the plant part sampled and on the growth stage. For many crops, threshold values have been established for particular plant parts at specified stages [P7]. Talk to your local farm advisor or the testing lab before sampling to determine what part should be sampled and when. Since all P is normally applied at planting, tissue P tests are most useful for adjusting the P rate for future crops. Tissue analysis is best combined with records of yields, fertilizer application rates and soil and irrigation water analyses, as part of a nutrient budget approach. Over time these values can be used to develop site- and variety-specific fertilizer rates and tissue nutrient thresholds. More information can be found here. All P fertilizer is normally applied prior to or at planting. This is because P is normally most limiting during early growth when the root system is still small [P5,P12,P15,P30] and, unlike N, there is little risk of in-season leaching. To maintain P availability at an optimal level in the long term, the P removed at harvest may be replaced. Estimates of the amount of P removed with the harvested products of several crops may be found here. The results of soil and tissue tests can be used to fine-tune this rate over time (see Soil Analysis and Plant Analysis). Higher rates may be applied if soil tests suggest a deficiency, while application rates can be reduced or skipped when the soil test value is high. In acidic and alkaline soils, P availability is greatly reduced [P18]. Under these conditions, soil P availability is better increased by adjusting the soil pH than by applying large amounts of P fertilizer. Preplant P fertilizer may be banded or broadcast and incorporated. Since P is not very mobile in the soil, fertilizers left on the soil surface will be less accessible by plant roots [P40]. Banding P fertilizer near the plant row is normally more efficient than broadcasting [P18]. This is especially true in soils that fix or retain P [P33]. However, in low-testing soils that do not fix P, broadcast applications can help encourage root growth throughout the bed [P18,P21]. For densely planted crops in which banding is not practical, P fertilizer is usually broadcast prior to bed listing. A dilute low-N, high-P starter may be applied to transplants either in the transplant water or as a dip prior to planting [P19,P34]. A number of granular and liquid P fertilizers are available for preplant applications. 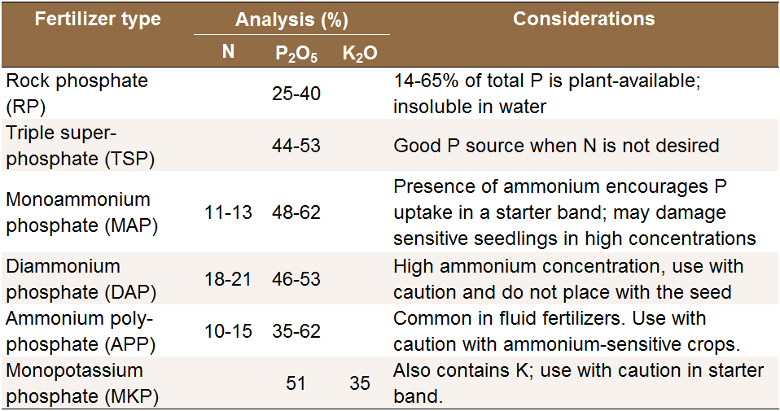 Example P fertilizers (adapted from [P18,P22]). On fine-textured soils, as well as soils that are acid or alkaline and may fix P, applications should be made as close to the time of planting as possible. This reduces P immobilization on soil surfaces [P18]. If only small applications are needed, they are best placed near the seed or transplant at planting (See Starter P). When rates are low, the entire P rate can be banded as starter fertilizer (See Preplant P). The amount of P that can safely be applied in a starter band depends on the crop, the soil test P, and the type of fertilizer used [P42]. In general, rates should be lower if the material also contains N or K since these are more likely to damage young seedlings. Many anticrustants contain usable amounts of P. Any P applied as an anticrustant should be taken into account when calculating P application rates [P19]. It is normally more efficient to band starter fertilizer than to broadcast it, as banding the fertilizer near plant row allows the small roots of the growing plants to access it easily [P44]. If the band also contains N or K it should not be too close to the seed, or seedlings may be damaged by free ammonia or salts [P18]. For many crops, placement 2 inches below and to the side of the seed row has been found to be safe and effective [P6,P18,P25,P47,P48,P49]. For high rates, dry, coarse soils, and ammonia- or salt-sensitive crops longer distances may be required [P18,P27,P48]. Grain crops sometimes benefit from placement of a small amount of fertilizer directly with the seed ("pop-up placement"), especially in cold, wet weather [P18,P37]. However, excess amounts can inhibit germination, if it also contains N or K. Fertilizers containing N or K should not be placed with the seed when soils are dry [P45]. A number of granular and liquid P fertilizers are available for preplant and starter applications. Fact sheets of the most common fertilizers can be found on the web site of the International Plant Nutrition Institute. The presence of N, particularly ammonium, in the fertilizer band improves P uptake. However, too much N fertilizer may damage the seedlings. Therefore low ammonium, high P fertilizers such as monoammonium phosphate (MAP) are recommended for starter fertilizers. MAP is preferable to diammonium phosphate (DAP), which has a higher salt index and gives off free ammonia, which is toxic to seedlings [P14,P37]. It is best to apply all P at planting, as P deficiencies in early growth have the most serious consequences for growth [P5,P12,P15,P30] and P is immobile in soil and unlikely to leach during the season [P18]. Supplemental P may be applied to address an emerging deficiency. In this case, it may be side-dressed or applied with irrigation water. Phosphorus can form precipitates that block emitters, and care should be taken to choose a P fertilizer that is compatible with the irrigation water chemistry [P7]. Side-dressed P should be banded below the soil surface, as surface-applied P risks not being available to plant roots. Topdress applications may not be useful, since they cannot be washed in with irrigation water and unless the roots are very near the soil surface the P will not be accessible [P18]. Many plants can respond to foliar P [P11,P32,P35,P36], and foliar P applications may be useful if disease or environmental stress prevent good root uptake or if the initial application was too low [P26,P35]. However, little P can be applied this way, and foliar applications generally don't have any benefits when soil P is adequate [P1,P32]. Therefore, while foliar P may be applied as a rescue measure for deficient plants, it is less effective than an adequate soil application [P20]. Applications to very young plants are unlikely to be effective, due to their small leaf area and low nutrient demand [P9,P38]. Foliar nutrients are most likely to be absorbed and least likely to cause leaf burn when they are applied to well-watered plants in the morning or late afternoon [P29,P38]. Applications should not be done on windy days, as this reduces distribution uniformity, or just before a rain is expected, as this may wash the fertilizer off the leaves [P9]. Potassium deficiency is normally characterized by the chlorosis (yellowing), and later death of tissue along the leaf edges. Unlike N deficiency, unaffected parts of the leaf often remain dark green [K40,K43]. 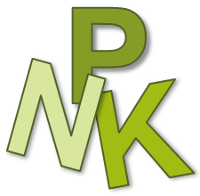 Like N and P, K is mobile in the plant and so symptoms normally begin on the lower leaves. 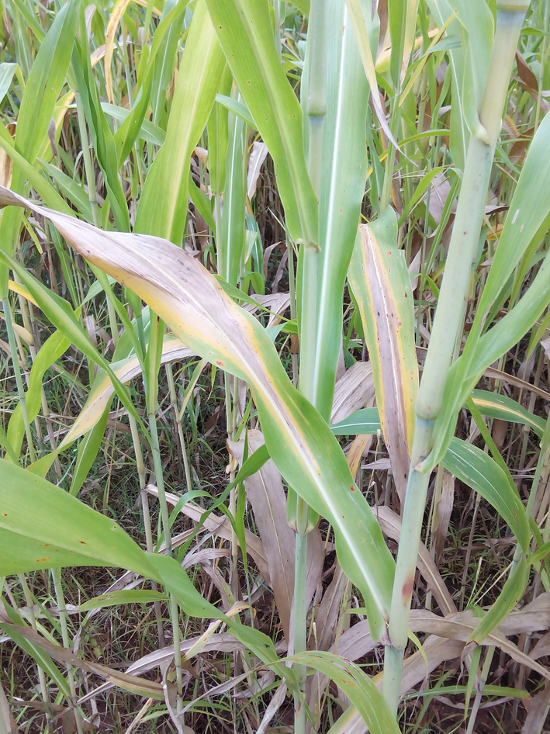 In grasses, K deficiency weakens the stalk, leading to lodging. It may also affect product size and storage quality [K13]. 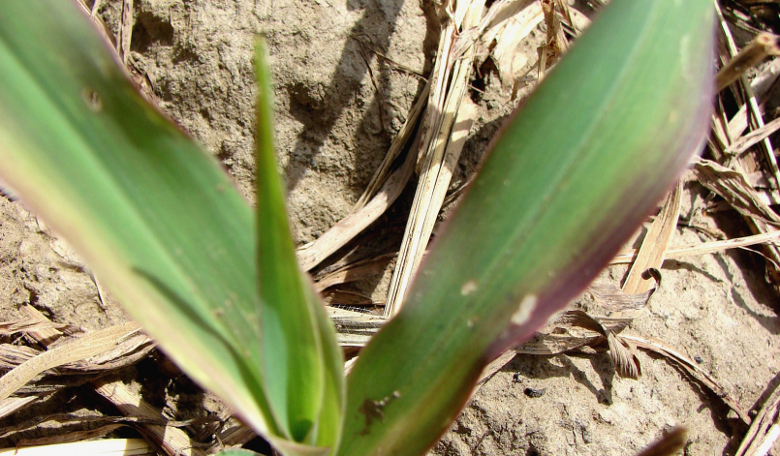 In many crops, K deficient plants are more susceptible to drought and diseases. Most soils in California are rich in K, and deficiencies have historically been uncommon [K6]. However, symptoms of potassium deficiency have been observed soils in the San Joaquin valley derived from Sierra Nevada alluvium, which tend to fix K [K32] (see K Fixation in the San Joaquin Valley). They are also more likely in the Delta on peat soils and soils with high perched water tables, and on sandy soils [K21,K25]. Potassium deficiency symptoms in cucumber (top) and sugarbeet (bottom), characterized by chlorosis ("firing") along the leaf edges (photos courtesy of the International Plant Nutrition Institute). Additinal photos of nutrient deficiencies in many crops may be found here. Samples for P and K should be taken between crops, when no fertilizer has been applied recently [K6,K10]. In order to track trends over time, sampling should always be done at the same time of year. Soil samples must be representative of the field, or the test will be of little value [K6,K13]. A total of 20-30 cores should be taken from random locations within the field. Soil samples are usually taken from the top 6-12 inches of the soil profile [K6,K13]. Although the roots of most crops go deeper, this tends to be the major rooting zone for most tilled annual crops [K7,K16,K26,K41]. However, deeper sampling may be useful when planting a very deep-rooted crop in a field for the first time [K31]. For more information on sampling procedure see Soil Test Sampling instructions. A detailed discussion of principles and considerations for soil P and K sampling can be found here. In California, plant available K is determined by extracting the soil samples with an ammonium acetate solution [K6]. When soil tests are performed regularly, trends over time indicate whether the fertilization program needs to be adjusted. To make accurate K fertilization decisions, soil test values are best combined with tissue K concentrations and K budgeting. In this way, K tests can be useful even for crops that do not have calibrated critical values [K13]. California soils generally have sufficient K for crop production, and response to K fertilizer historically has not been common [K6]. However, maintenance applications based on estimated crop removal will help avoid K depletion in the long term [K39]. Tissue tests are most meaningful if taken several times during the season [K24]. Plant nutrient concentrations vary depending on the plant part sampled and on the growth stage. For many crops, threshold values have been established for particular plant parts at specified stages [K4]. Talk to your local farm advisor or the testing lab before sampling to determine what part should be sampled and when. Since K is normally applied at planting, tissue K tests are mostly useful for adjusting the K rate for future crops. K fertilizers are normally applied pre-plant, although in drip-irrigated systems fertigation in-season is also practiced. Potassium is less at risk of in-season leaching than N, so split applications are not as necessary [K13]. In-season K is mostly likely to be beneficial in very sandy soils, and in soils that fix K [K33]. To maintain K availability at an optimal level in the long term, the K removed at harvest should be replaced. Estimates of the amount of K removed with the harvested products of several crops may be found here. It is especially important to account for the K in the straw or residues if they are also removed, as they often have high K concentrations [K8,K28,K42]. Higher rates may be required if soil tests suggest there is a deficiency. The results of soil and tissue tests can be used to fine-tune this rate over time (see Soil Analysis and Plant Analysis). Preplant K may be banded or broadcasted and incorporated. Potassium fertilizer left on the surface may not be accessible by plants, since K is not very mobile in soil [K13]. With low fertilization rates, nutrient uptake by crops is generally greater for band than for broadcast applications. With higher application rates, the difference between the two methods diminishes [K34]. Banding is more likely to be effective on calcareous, heavy, or K-fixing soils [K19]. High rates should not be banded close to where the plant rows will be, to avoid salt damage. 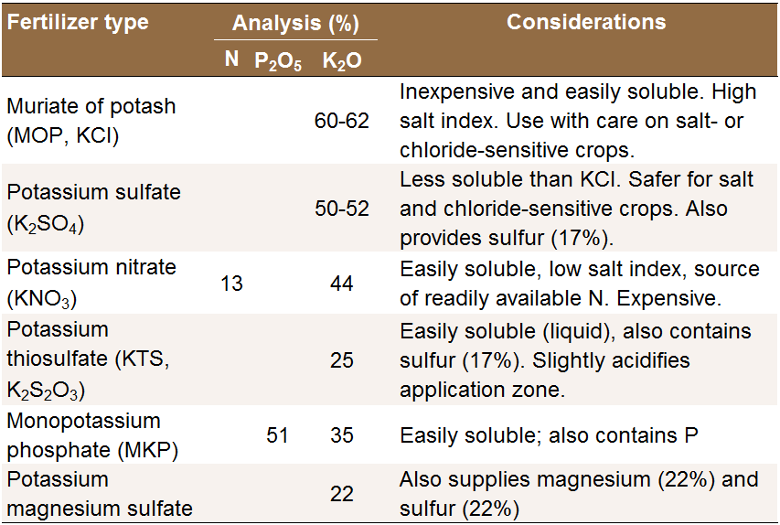 Many K fertilizers are available (see Table). Choice of fertilizer may be made based on price and whether the application of chloride, sulfate or magnesium is beneficial. Potassium chloride (muriate of potash, KCl) is the most popular K fertilizer, as it is inexpensive and easily soluble. However, care should be taken when using it on crops that are sensitive to salt or chloride [K37]. Example potassium fertilizers (adapted from [K13,K15]). For furrow and sprinkler-irrigated crops, all K is normally applied pre-plant. Pre-plant K may be applied any time between crops, since on most soils K is not at risk of leaching. If very high rates of K are needed, applying the whole rate just before planting may be risky [K23,K36]. In this case, either applying the preceding fall (for spring-planted crops) or splitting the application between fall and spring may be beneficial [K23]. Potassium does not have to be applied every year, so maintenance K applications can be made before the most responsive crop in a rotation [K3,K13,K29]. Relatively K-responsive crops grown in California include cotton[K29], potato [K37], celery [K9] and tomato [K11]. Potassium is not commonly applied as a starter fertilizer. However, applying a little K near or with the seed at planting may be beneficial in soils that fix K and or when the soil is cold and wet at planting [K13,K17]. Starter bands are normally placed a few inches away from and below the seed row. The amount of N+K which can be placed in a starter band is limited, as these fertilizers tend to have a high salt index and may damage seedlings. According to the Western Fertilizer Handbook, when starter fertilizer is applied at a distance of more than 2 inches from the seed, the amount of N + K2O that can be applied safely is 20 and 40 lbs/acre in sandy and fine-textured soil, respectively [K4]. For grain crops, it may be beneficial to place a small amount of starter with the seed (pop-up placement). As a general rule, no more than 10 lbs K2O/acre should be placed in direct contact with the seed, and total N+K placed with the seed should not exceed 10-20 lbs/acre [K13]. Seed placement is not recommended in sandy, dry, or saline soils [K4]. For drip-irrigated crops, most of the K requirement may be fertigated in-season. In this way, rates can be tailored to the needs of the developing crop. 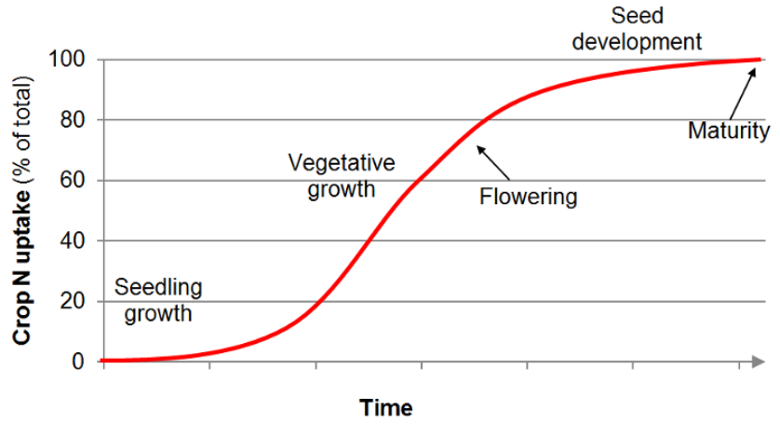 In general, the K uptake pattern of annual crops follows an 'S' pattern similar to that of N, where an initial lag phase of slow vegetative growth and uptake is followed by a period of rapid growth and uptake. This is the time when K supply needs to be adequate [K12,K35,K38,K45]. In-season K is best applied through drip irrigation [K13]. For fields which are not drip-irrigated, side-dress applications are also possible. These should be done early enough that the fertilizer can be shanked in without injuring roots. Sprinkler and broadcast applications are only likely to be effective on very sandy soils, where K can be washed into the root zone [K2,K14]. Otherwise, surface and top-dress applications are not advised, as the mobility of K in the soil is limited and plants have restricted access to K in dry surface soil [K20]. For fertigation, KCl or potassium thiosulfate (KTS) are generally preferred over potassium sulfate due to their higher solubility [K13]. For chloride- and salt-sensitive crops, or in areas with saline soils or irrigation water, KCl may not be appropriate. Consult your local farm advisor for more information. Fact sheets of the most common fertilizers can be found on the web site of International Plant Nutrition Institute. Foliar K applications are not common, and little research has been done in California. While many crops are able to take up foliar K [K1,K18,K22,K27], K is normally required in much larger amounts than can be applied foliarly [K5]. With adequate soil K availability, foliar K applications are likely to have limited effect on yield. Foliar K applications are most likely to be useful when late-season K is required to address a deficiency, and root uptake from the soil is limited because of salinity, root damage, or K- fixing soils [K27,K44]. Applications to very young plants are unlikely to be effective, due to their small leaf area and low nutrient demand [K5,K30]. Foliar nutrients are most likely to be absorbed and least likely to cause leaf burn when they are applied to well-watered plants in the morning or late afternoon [K25,K30]. Applications should not be done on windy days, as this reduces distribution uniformity, or just before a rain is expected, as this may wash the fertilizer off the leaves [K5]. Baldini, M., Vannozzi, G., Macchia, M., Turi, M., 1996. Relationship between different water and nitrogen supplies on yield and nitrogen utilisation and partitioning in sunflower. 14th International Sunflower Conference, Shenyang, China. Vol 1, 412-418. Bender, B.A., 1993. Onions. In: Bennett, W.F., (Ed.). Nutrient Deficiencies and Toxicities in Crop Plants. The American Phytopathological Society, St. Paul., MN. pp. 131-135. Blamey, F.P.C., Edwards, D.G., Asher, C.J., 1987. Nutritional disorders of sunflower. Department of Agriculture, University of Queensland, Australia. Bouwmeester, R.J.B., Vlek, P.L.G., Stumpe, J.M., 1985. Effect of environmental factors on ammonia volatilization from a urea fertilized soil. Soil Science Society of America Journal 49, 376-381. Brown, B., 2000. Southern Idaho fertilizer guide for onions. University of Idaho Cooperative Extension. Clark, R.B., 1993. Sorghum. In: Bennett, W.F., (Ed.). Nutrient Deficiencies and Toxicities in Crop Plants. The American Phytopathological Society, St. Paul., MN. pp. 21-26. Doerge, T.A., Roth, R.L., Gardner, B.R., 1991. Nitrogen fertilizer management in Arizona: Cantaloupe. University of Arizona. pp. 52-54. Fageria, N.K., Barbosa Filho, M.P., Moreira, A., Guimarães, C.M., 2009. Foliar fertilization of crop plants. Journal of Plant Nutrition 32, 1044-1064. Feigin, A., Letey, J., Jarrell, W.M., 1982. Nitrogen utilization efficiency by drip irrigated celery receiving preplant or water applied N fertilizer. Agronomy Journal 74, 978-983. Fernández, F.G., Nafziger, E.D., Ebelhar, S.A., Hoeft, R.G., 2012. Managing nitrogen. University of Illinois Extension & Outreach. Illinois Agronomy Handbook. Geisseler, D., Horwath, W.R., 2015. Crop nitrogen uptake and partitioning. Goswami, K., Srivastava, G.C., 1987. Effect of foliar application of urea on leaf senescence and photosynthesis in sunflower (Helianthus annuus L.). Photosynthetica 22, 99-104. Grogan, R.G., Zink, F.W., 1956. Fertilizer injury to lettuce. California Agriculture 10(12), 5-16. Grove, I.G., Haydock, P.P.J., Evans, K., Lewis, D.J., 1999. Basal fertiliser application method, tuber initiation nitrogen, foliar NPK and the tolerance of potatoes to infection by the potato cyst nematodes Globodera rostochiensis and G. pallida. Annals of Applied Biology 134, 205-214. Hall, R., Schwartz, H.F., 1993. Common bean. In: Bennett, W.F., (Ed.). Nutrient Deficiencies and Toxicities in Crop Plants. The American Phytopathological Society, St. Paul., MN. pp. 149- 156. Hartz, T., 1998. Evaluation of pre-sidedress soil nitrate testing to determine N requirements of cool season vegetables. FREP Final Report . Hartz, T.K., 2007. Soil testing for nutrient availability: procedures and interpretation for California vegetable crop production. University of California Vegetable Research and Information Center. Hartz, T.K., Bendixen, W.E., Wierdsma, L., 2000. The value of presidedress soil nitrate testing as a nitrogen management tool in irrigated vegetable production. HortScience 35, 651-656. Hartz, T.K., Giannini, C., Miyao, E.M., Valencia, J.G., 2002. Divergent transplant production practices produce comparable growth, yield, and quality of processing tomatoes. HortScience 37, 296-299. Havlin, J.L., Beaton, J.D., Tisdale, S.L., Nelson, W.L., 2005. Soil Fertility and Fertilizers, 7th ed. Pearson Education, Inc., Upper Saddle River, New Jersey. Hemphill, D.D., 1982. Anti crustant effects on soil mechanical resistance and seedling emergence. HortScience 17, 391-393. Hocking, P.J., Steer, B.T., 1983. Distribution of nitrogen during growth of sunflower (Helianthus annuus L.). Annals of Botany 51, 787-799. Field Crops Research 6, 93-107. Hocking, P.J., Steer, B.T., 1995. Effects of timing and supply of nitrogen on nitrogen remobilization from vegetative organs and redistribution to developing seeds of sunflower. Plant & Soil 170, 359-370. Hussain, R.A., Ahmad, R., Mawaz, F., Ashraf, M.Y., Waraich, E.A., 2016. Foliar NK application mitigates drought effects in sunflower (Helianthus annuus L.). Acta Physiologiae Plantarum 38:83. Johnson Hake, S., Hake K.D., Kerby T.A., 1996. Prebloom decisions. In: Hake, S.J., Kerby T.A., Hake, K.D. (Eds.) Cotton Production Manual. University of California, Division of Agriculture and Natural Resources, Publication 3352. pp. 29-50. Jones, C.A., Koenig, R.T., Ellsworth, J.W., Brown, B.D., Jackson, G.D., 2007. Management of urea fertilizer to minimize volatilization. Extension Publication EB 173, Montana State University. Kelling, K.A., Hensler, R.F., Speth, P.E., 2015. Importance of early-season nitrogen rate and placement to Russet Burbank potatoes. American Journal of Potato Research. DOI: 10.1007/s12230-015-9464-6. Kerns, D.L., Matheron, M.E., Palumbo, J.C., Sanchez, C.A., Still, D.W., Tickes, B.R., Umeda, K., Wilcox, M.A., 1999. Guidelines for head lettuce production in Arizona. Cooperative Extension University of Arizona. Lang, N.S., Stevens, R.G., Thornton, R.E., Pan, W.L., Victory, S., 1999. Potato nutrient management for central Washington. Washington State University Cooperative Extension publication EB1871. Lazicki, P.A., Geisseler, D., 2016. Soil nitrate testing supports nitrogen management in irrigated annual crops. California Agriculture 71(2), 90-95. Le Strange, M., Cahn, M.D., Koike, S.T., Smith, R.F., Daugovish, O., Fennimore, S.A., Natwick, E.T., Dara, S.K., Takele, E., Cantwell, M.I., 2010. Broccoli production in California . UC ANR Publication 7211. Lingle, J.C., Wight, J.R., 1964. Fertilizer experiments with cantaloupes. University of California Division of Agricultural Sciences Bulletin 807. Linquist, B.A., Cassman, K.G., Fulton, A.E., Jackson, L.F., 1992. Late-season nitrogen may be efficient way to increase winter wheat protein. California Agriculture 46(2), 13-16. Locascio, S.J., 1993. Cucurbits: Cucumber, muskmelon, and watermelon. In: Bennett, W.F., (Ed.). Nutrient Deficiencies and Toxicities in Crop Plants. The American Phytopathological Society, St. Paul., MN. pp. 123-130. Long, R., Mathesius, K., Vaccaro, B., Symmes, E., Bali, K., Gulya, T., (in preparation). Sunflower hybrid seed production in California. UC ANR Publication. Lorenz, O.A., Tyler, K.B., 1976. Plant tissue analysis of vegetable crops. In: Reisenauer, H.M. (Ed.). Soil and Plant-Tissue Testing in California. University of California, Division of Agricultural Sciences, Bulletin 1879. pp. 24-29. Lorenz, O.A., Bishop, J.C., Hoyle, B.J., Zobel, M.P., Minges, P.A., Doneen, L.D., Ulrich, A., 1954. Potato fertilizer experiments in California. California Agricultural Experiment Station Bulletin 744. Makries, J.L., Warncke, D.D., 2013. Timing nitrogen applications for quality tops and healthy root production in carrot. Communications in Soil Science & Plant Analysis 44, 2860-2874. May, D., Le Strange, M., Hanson, B., 2008. Fertilizer and irrigation studies in drip irrigated fresh market onions and furrow irrigated garlic and processed onions. Garlic and Onion Symposium, Tulare, California, Feb 11, 2008. McVay, K., Burrows, M., Jones, C., Wanner, K., Manalled, F., 2009. Montana barley production guide . Extension Publication EB 0186, Montana State University. Miyao, G., 2002. Fertilizer guidelines for processing tomatoes. Vegetable Crop Facts Merced and Madera County. Munier, D., Kearney, T., Pettygrove, G.S., Brittan, K., Mathews, M., Jackson, L., 2006. Fertilization of small grains. In: UC ANR (Ed.). Small Grain Production Manual. ANR Publication 8208. Oosterhuis, D.M., Hake, K., Burmester, C., 1991. Foliar feeding cotton. Cotton Physiology Today 2, 1-8. Pettygrove, S., Hartz, T., Hanson, B., Jackson, L., Smith, R., Lockhart, T., Grattan, S., 2003. Nutrient management in cool-season vegetables. UC ANR Pub 8098. Oakland, CA. Pew, W.D., Gardner, B.R., 1972. Nitrogen effects on cantaloupes. Communications in Soil Science & Plant Analysis 3, 467-476. Sangakkara, U.R., Cho, C.M., 1987. Effect of NH4+ nitrogen on phosphorus uptake by canola, lentils, soybeans and wheat. Journal of Agronomy & Crop Science 159, 199-201. Schulbach, K., Smith, R., Hartz, T., Jackson, L., 1996. Guide to nitrogen quick-tests for vegetables with the 'Cardy' nitrate meter. FREP Final Report. Shelp, B.J., 1987. Plant characteristics and nutrient composition and mobility of broccoli (Brassica oleracea var. italica) supplied with NH4+, NO3- or NH4NO3 . Journal of Experimental Botany 38, 1603- 1618. Smith, R., 2011. Fertilizer burn issues on lettuce . Salinas Valley Agriculture. Stone, D.A., 1998. The effects of 'starter' fertilization injection on the growth and yield of drilled vegetable crops in relation to soil nutrient status. Journal of Horticultural Science & Biotechnology 73, 441-451. Sullivan, D.M., Brown, B.D., Shock, C.C., Horneck, D.A., Stevens, R.G., Pelter, G.Q., Fiebert, E.B.G., 2001. Nutrient management for onions in the Pacific Northwest. Pacific Northwest Extension Publication 546. Tan, X.W., Ikeda, H., Oda, M., 1999. Absorption, translocation, and assimilation of foliar-applied urea compared with nitrate and ammonium in tomato plants. Soil Science & Plant Nutrition 45, 609-616. Turner, D.O., Brauen, S.E., Halvorson, A.R., 1976. Fertilizer guide: winter wheat and barley for western Washington. FG-17 (Rev). Washington State University Cooperative Extension Service. University of California Small Farms Program, 2012. Fertilizing vegetables. Veseth, R., 1984. Fertility management for no-till and minimum tillage systems. In: Pacific Northwest Conservation Tillage Handbook. Vigil, M.F., Hergert, G.W., Mengel, D.B., 2009. Nutrient management. In: Meyer, R., (Ed.). High Plains Sunflower Production Handbook. Kansas State University Agricultural Experiment Station and Cooperative Extension Service MF-2384. Voss, R.E., Mayberry, K.S., 1999. Dehydrator bulb onion production in California. UC ANR Publication 7239. Walworth, J.L., Carling, D.E., Michaelson, G.J., 1992. Nitrogen sources and rates for direct-seeded and transplanted head lettuce. HortScience 27, 228-230. Webster, J.R., Jackson, L.F., 1993. Management practices to reduce lodging and maximize grain yield and protein content of fall- sown irrigated hard red spring wheat. Field Crops Research 33, 249-259. Weir, R.G., Cresswell, G.C., 1993. Plant nutrient disorders 3. Vegetable crops. Inkata Press, Melbourne, Sidney. Wells, B.R., Huey, B.A., Norman, R.J., Helms, R.S., 1993. Rice. In: Bennett, W.F. (Ed.). Nutrient Deficiencies and Toxicities in Crop Plants. APS Press, St. Paul, MN. pp. 15-20. Wilcox, G.E., 1993. Tomato. In: Bennett, W.F. (Ed.). Nutrient Deficiencies and Toxicities in Crop Plants. APS Press, St. Paul, MN. pp. 137-141. Bednarz, C.W., Hopper, N.W., and Hickey, M.G., 1999. Effects of foliar fertilization of Texas southern high plains cotton: Leaf phosphorus, potassium, zinc, iron, manganese, boron, calcium, and yield distribution. Journal of Plant Nutrition 22, 863-875. Brandon, D.M., Mikkelsen, D.S., 1979. Phosphorus transformations in alternately flooded California soils: I. Cause of plant phosphorus deficiency in rice rotation crops and correctional methods. Soil Science of America Journal 43, 989-994. Brewster, J.L., 2008. Onions and Other Vegetable Alliums, 2nd Edition. CAB International. Cassman, K. G. 1993. Cotton. In Bennett, W. F. (Ed.) Nutrient Deficiencies and Toxicities in Crop Plants. APS Press, St. Paul, MN. pp. 111-119. Geisseler, D., Miyao, G., 2016. Soil testing for P and K has value in nutrient management for annual crops. California Agriculture 70(3), 152-159. Girma, K., Martin, K.L., Freeman, K.W., Mosali, J., Teal, R.K., Raun, W.R., Moges, S.M., Arnall, D.B., 2007. Determination of optimum rate and growth stage for foliar-applied phosphorus in corn. Communications in Soil Science & Plant Analysis 38, 1137-1154. Grant, C.A., Flaten, D.N., Tomasiewicz, D.J., Sheppard, S.C., 2001. The importance of early season phosphorus nutrition. Canadian Journal of Plant Science 81, 211-224. Greenwood, D.J., Gerwitz, A., Stone, D.A., Barnes, A., 1982. Root development of vegetable crops. Plant & Soil 68, 75-96. Hartz, T.K., Hanson, B., 2009. Drip irrigation and fertigation management of processing tomato. University of California Vegetable Research and Information Center. Hartz, T.K., Johnstone, P.R., Williams, E., Smith, R.F., 2007. Establishing lettuce leaf nutrient optimum ranges through DRIS analysis. HortScience, 42, 143-146. Hopkins, B.G., Ellsworth, J.W., Bowen, T.R., Cook, A.G., Stephens, S.C., Jolley, V.D., Shiffler, A.K., Eggett, D., 2010. Phosphorus fertilizer timing for Russet Burbank potato grown in calcareous soil. Journal of Plant Nutrition 33, 529-540. Hopkins, B.G., Horneck, D.A., MacGuidwin, A.E., 2014. Improving phosphorus use efficiency through potato rhizosphere modification and extension. American Journal of Potato Research 91, 161-174. Jaafar, M.N., Stone, L.R., Goodrum, D.E., 1993. Rooting depth and dry matter development of sunflower. Agronomy Journal 85, 281-286. Jones, C., Jacobsen, J., 2009. Fertilizer placement and timing . Montana State University Extension 4449-11. López-Bucio, J., Cruz-Ramírez, A., Herrera-Estrella, L., 2003. The role of nutrient availability in regulating root architecture. Current Opinion in Plant Biology 6, 280-287. Machado, R.M.A., Oliveira, M.R.G., 2005. Tomato root distribution, yield and fruit quality under different subsurface drip irrigation regimes and depths. Irrigation Science 24, 15-24. Malakondaiah, N., Safaya, N.M., Wali, M.K., 1981. Responses of alfalfa and barley to foliar application of N and P on a coal mine spoil. Plant & Soil 59, 441-453. Martin, W.E., Sailsbery, R.L., Brandon, M., Petersen, R.T., 1971. Answering the riddle of poor safflower after rice: banded phosphorus may be the solution. California Agriculture 25(9), 4-6. Mosali, J., Desta, K., Teal, R.K., Freeman, K.W., Martin, K.L., Lawles, J.W., Raun, W.R., 2006. Effect of foliar application of phosphorus on winter wheat grain yield, phosphorus uptake, and use efficiency. Journal of Plant Nutrition 29, 2147-2163. Mukherjee, S.K., De, R., Saxena, P.N., 1966. Efficiency of utilization of soil- and foliar- applied nitrogen and phosphorus as revealed by tuber production and nutrient uptake of potatoes. Soil Science 102, 278-283. Pace, M.G., Israelsen, C.E., Creech, E., Allen, N., 2015. Growing safflower in Utah. Utah State University Extension. Smith, R., Biscaro, A., Cahn, M., Daugovish, O., Natwick, Nunez, J., Takele, E., Turini, T., 2011. Fresh-market bulb onion production in California. UC ANR Publication 7242. Stark, J.C., Brown, B.D., 2003. Nutrient management. In: Robertson, L.D., Stark, J.C. (Ed.). Idaho Spring Barley Production Guide. University of Idaho Bulletin 742, 22-26. UC IPM, 2009. UC IPM pest management guidelines: Lettuce fertilization. UC ANR Publication 3450. Wiese, M.V., 1993. Wheat and other small grains. In: Bennett, W.F. (Ed.). Nutrient Deficiencies and Toxicities in Crop Plants. APS Press, St. Paul, MN. pp. 27-33. Wilcox, G.E., 1993. Tomato. In: Bennett, W.F. (Ed.). Nutrient Deficiencies and Toxicities in Crop Plants. APS Press, St. Paul, MN. pp. 137- 141. Aown, M., Raza, S., Saleem, M.F., Anjum, S.A., Khaliq, T., Wahid, M.A., 2012. Foliar application of potassium under water deficit conditions improved the growth and yield of wheat (Triticum aestivum L.). Journal of Animal & Plant Sciences 22, 431- 437. Brennan, R.F., Jayasena, K.W., 2010. Increasing applications of potassium fertilizer to barley crops grown on deficient sandy soils increased grain yields while decreasing some foliar diseases. Australian Journal of Agricultural Research 58, 680-689. Brown, B., 2009. Irrigated winter barley. Idaho Nutrient Management, University of Idaho. Halevy J., 1976. Growth rate and nutrient uptake of two cotton cultivars grown under irrigation. Agronomy Journal 68, 701-705. Hartz, T.K., 2007b. Soil testing for nutrient availability: procedures and interpretation for California vegetable crop production. University of California Vegetable Research and Information Center. Hartz, T.K., Miyao, E.M., Mullen, R.J., Cahn, M.D., Valencia, J., Brittan, K.L., 1999. Potassium requirements for maximum yield and fruit quality of processing tomato. Journal of the American Society for Horticultural Science 124, 199-204. Hartz, T.K., Johnstone, P.R., Francis, D.M., Miyao, E.M., 2005. Processing tomato yield and fruit quality improved with potassium fertigation. HortScience 40, 1862-1867. Hopkins, B., Stark, J., 2010. Potato nutrition. In: Bohl, W.H., Johnson, S.B., (Eds.). Commercial Potato Production in North America. American Potato Journal Supplement Vol. 57, 2nd revision. pp. 57- 62. Jackson, G.D., Kushnak, G.D., Benson, A.N., Skogley, E.O., Lund, R.E., 1991. Potassium response in no-till small grain production. Journal of Fertilizer Issues 8, 89-92. Jifon, J.L., Lester, G.E., 2009. Foliar potassium fertilization improves fruit quality of field-grown muskmelon on calcareous soils in south Texas. Journal of the Science of Food and Agriculture 89, 2452-2460. Johnson Hake, S., Hake, K.D., Kerby, T.A., 1996a. Preparation for the new crop season - fall/winter. In: Hake, S.J., Kerby T.A., Hake, K.D. (Eds.) Cotton Production Manual. University of California, Division of Agriculture and Natural Resources, Publication 3352. pp. 6-14. Johnson Hake, S., Hake K.D., Kerby T.A., 1996b. Prebloom decisions. In: Hake, S.J., Kerby T.A., Hake, K.D. (Eds.). Cotton Production Manual. University of California, Division of Agriculture and Natural Resources, Publication 3352. pp. 29- 50. Kaffka, S.R., Kearney, T.E., 1998. Safflower production in California. University of California Agriculture and Natural Resources Publication 21565. Khan, M.Z., Akhtar, M.E., Safdar, M.N., Mahmood, M.M., Ahman, S., Ahmed, N., 2010. Effect of source and level of potash on yield and quality of potato tubers. Pakistan Journal of Botany 42, 3137-3145. Marsh, B., Pettygrove, S., Southard, R., Roberts, B., Munk, D., Vargas, R., Hutmacher, B., 2003. Soil and plant sampling: key to potassium management. California Cotton Review 66, 8-9. Narem, R.A., 1982. Nitrogen fertility requirements, dry matter production and nutrient uptake of sunflower. M.S. thesis. South Dakota State University, Brookings. Oosterhuis, D.M., 2002. Potassium management of cotton. In: Pasricha, N.S., Bansal, S.K. (Eds.) Potassium for Sustainable Crop Production. International Potash Institute, Basel, Switzerland and Potash Research Institute of India, Gurgaon, Haryana. pp. 321-346. Pettygrove, G.S., Southard, R.J., 2003. Can we predict K fixation in the San Joaquin Valley from soil texture and mineralogy? FREP Final Report. Pettygrove, G.S., O'Geen, T., Southard, R., 2011. Potassium fixation and its significance for California crop production. Better Crops 95 (4), 16-18. Randall, G.W., Hoeft, R.G., 1988. Placement methods for improved efficiency of P and K fertilizers: A review. Journal of Production Agriculture 1, 70-78. Rincón Sánchez, L., Pellicer Botía, C., Sáez Sironi, J., Abadía Sánchez, A., Pérez Crespo, A., Marín Nartínez, C., 2001. Crecimiento vegetativo y absorción de nutrientes de la coliflor. Investigación Agraria: Producción y Protección Vegetales 16, 119-131. Rosen, C., McNearney, M., Bierman, P., 2012. Optimizing potassium management for irrigated potato production: Russet Burbank. Research Report to the Northern Plains Potato Grower's Association. Snyder, C., 2010. Potassium and potatoes. Western Farm Press April 26, 2010. Accessed 1/18/2018. Sosa, A., Padilla, J., Ortiz J., Etchevers, J.D., 2012. Biomass accumulation and its relationship with the demand and concentration of nitrogen, phosphorus, and potassium in lettuce. Communications in Soil Science & Plant Analysis 43, 121-133. Tyler, K.B., Lorenz, O.A., Nelson, P.M., Bishop, J.C., 1959. Soil potassium for potatoes: Depletion of soil potassium by cropping necessitates potash fertilization in certain areas of Kern and Tulare counties. California Agriculture 13(6), 8-8. Ulrich, A., 1993. Potato. In: Bennett, W.F., (Ed.). Nutrient Deficiencies and Toxicities in Crop Plants. The American Phytopathological Society, St. Paul., MN. pp. 149-156.
van Duivenbooden, N., de Wit, C.T., van Keulen, H., 1996. Nitrogen, phosphorus and potassium relations in five major cereals reviewed in respect to fertilizer recommendations using simulation modeling. Fertilizer Research 44, 37- 49. Zheng, Y., Xianbin, X., Simmons, M., Zhang, C., Gao, F., Li, Z., 2010. Responses of physiological parameters, grain yield and grain quality to foliar applications of potassium nitrate in two contrasting winter wheat cultivars under salinity stress. Journal of Plant Nutrition & Soil Science 173, 444-452. Zink, F.W., 1966. Celery growth and nutrient absorption studies. California Agriculture 20(7), 10-10.